In the fifth pAsuram, AzhwAr mentioned about how emperumAn took him when he tried to move away from emperumAn. 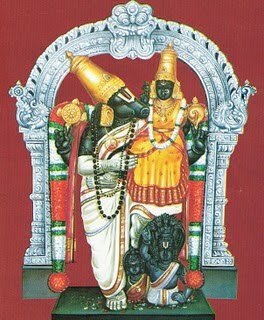 In the sixth pAsuram he expressed his desire to see emperumAn’s divine form by saying “karumAmuRi mEni kAttudhiyO”. As a means of fulfilling AzhwAr’s desire, emperumAn showed his divine form to AzhwAr’s heart. Not satisfied with this mAnasa sAkshAthkAram (seeing through the mind), AzhwAr expresses his sorrow in this pAsuram saying “I am not fortunate to see his divine form and being embraced by him. The difference between what I desired and what I got is similar to that between a mountain and a molehill. I did not get the experience which my heart obtained”. ammA – Oh my swAmy! yAmE aruvinaiyOm sEyOm – I, having great sins such that I cannot see you and embrace you, am at a very far distance from you. Could emperumAn be attained by a samsAri (dweller in this materialistic realm) like me that easily? en nenjinAr thAmE aNuakkarAych chArndhozhindhAr – My mind, without my permission, had reached at close proximity with emperumAn, on its own. Due to this, I too, though did not get what I desired, could get the benefit of enjoying [emperumAn] with my heart. Unlike me who decided to go away from emperumAn since I am not qualified to experience him, my heart, which went ahead of me towards emperumAn, fell head over heels and enjoyed him, thus carrying out the benefit for me, of seeing emperumAn through the mind. Since the heart carried out such benefit for him, AzhwAr is referring to his heart as “nenjinAr” (a respectable term). Through the rest of the pAsuram, AzhwAr gives the reason for his leaving emperumAn and for his heart falling head over heels on emperumAn. pU mEya sem mAdhai nin mArbil sErviththu – having periya pirAtti (SrI mahAlakshmi) who is residing on a lotus flower, who is of reddish complexion and who has great qualities, to unite with his chest during the time of churning the milky ocean for obtaining nectar. The meaning for this could also be construed as mentioned in thiruvAimozhi 6-10-10 “agalagillEn iRaiyum enRu” (not leaving emperumAn even for a moment), of having pirAtti always on the divine chest. The reason for mentioning that emperumAn is the consort of pirAtti is to justify his leaving emperumAn who is such a great entity and he, assuming of himself as a lowly entity. At the same time, his heart thinks “Should I lose out on emperumAn when pirAtti is always dwelling on his chest” and hence approaches emperumAn. ammA – this would refer to his being the supreme entity as well to his being the ordained lord. Here too, the opinion is that this is the reason for AzhwAr leaving emperumAn since he is the supreme entity and for his heart to approach emperumAn as he is the ordained lord. The lines should be rearranged to read ammA nin pAdhaththarugu – en nenjinAr thAmE aNukkarAych chArndhozhindhAr – yAmE aruvinaiyOm sEyOm. We will take up the 8th pAsuram next. This entry was posted in iyaRpA, periya thiruvandhAdhi on October 13, 2018 by T N Krishnan.